While USD is getting weak due to the trump’s trade adviser issue with Germany, EUR is being empowered by the Unemployment Change in Germany and positive Q4 GDP. 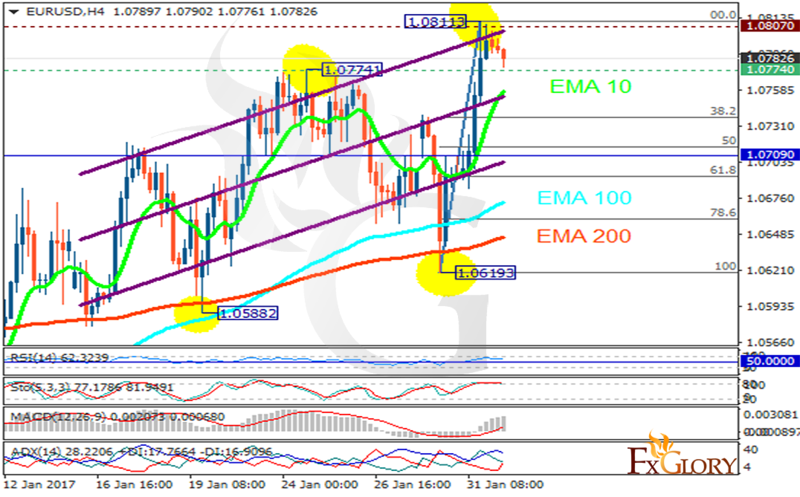 The support rests at 1.07740 with resistance at 1.08070 which both lines are above the weekly pivot point at 1.07090. The EMA of 10 is moving with bullish bias along the ascendant channel and it is above the EMA of 100 and the EMA of 200. The RSI is falling towards the 50 level, the Stochastic is moving in high ranges and the MACD indicator is in positive territory. The ADX is not showing any clear signals. The pair is moving with bearish tone targeting the 61.8 level of Fibonacci retracement at 1.0700.